As we know, the Palm Sunday commemorates the ‘triumphal’ entry of Jesus into Jerusalem. At least for once in his earthly life, Jesus is received like a king. People of all ages thronged the streets of Jerusalem, they made Jesus sit on a colt like a king, they spread clothes on his way, shouted slogans and sang ‘hosanna’ to him. Outwardly this is what happened that day in Jerusalem. But the whole event had deeper inner meanings. There were many occasions during the public ministry of Jesus when the crowd wanted to enthrone him as a king, because they were fascinated by the miracles he performed. But on all those occasions, Jesus intentionally and skillfully avoided them, evaded them. He never allowed himself to be the subject of the crowd’s flattery. He kept a safe distance from all seductions of power, fame, recognition and publicity. But once and for all, he yields to the pressure of the crowd - on Palm Sunday, but with a clear purpose, namely, to convey a definite message about Christian discipleship. The only time, when Jesus allowed the people to call him a king and receive him as a king, was for him an occasion to teach the people the true nature of his kingship and of his kingdom. Though he allows himself to be called a king, he purposefully mounts a colt. This was a contrast. A king and a colt do not seem to go together. As far as the Gospel account goes, it was not a casual act, it was all pre-planned. Jesus had kept the colt ready for his entry into Jerusalem. He sent his disciples with clear instructions as to where to find the colt and what to do with it. This act was deeply symbolic. We are not aware of any great king or emperor of history who rode a colt. Such people rode powerful horses, ornamented chariots, or they were carried in their golden thrones by their aids. Colt, instead, in every culture is the symbol of meekness and weakness. By purposefully bringing a colt and mounting it, Jesus taught us what his kingship consisted of. His kingship means service in humility, suffering for the sake of love, giving up and forgiving and total self-emptying. This is what the events of the week that followed this triumphal entry of Palm Sunday witnessed to us – his passion, his washing the feet of his disciples culminating in the death on the cross. The biggest contrast of his kingship is seen on the Friday after the Palm Sunday – a king, wearing not the golden crown of power, but a crown of thorns, carrying in his hand not the staff of authority, but a meek reed, sitting not on his golden throne, but lying naked on the cross and uttering a cry of utter helplessness. This is the picture of Jesus the King that the Gospels give us. The Palm Sunday of Jesus was not a mere event in the life of Jesus; rather, it was the reflection of the basic culture that Jesus lived all through his life. Palm Sunday is the basic way of life, which every Christian is called to live. In a world where there is so much of pomp, show of power, craze for recognition, abuse of authority, extravagance, exaggerated sense of self-sufficiency, individualism and so many ways of heartless behavior, the Palm Sunday points to a different culture. 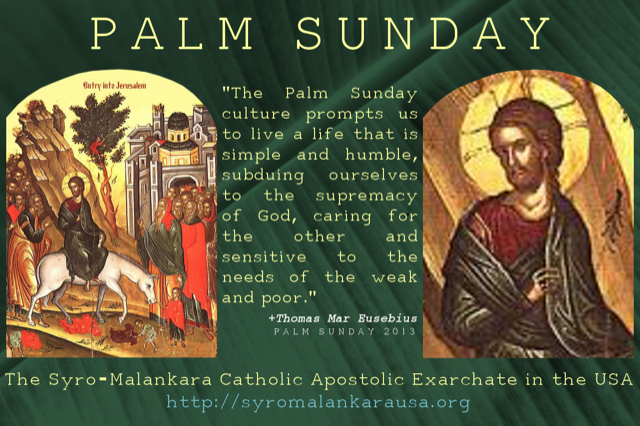 The Palm Sunday culture prompts us to live a life that is simple and humble, subduing ourselves to the supremacy of God, caring for the other and sensitive to the needs of the weak and poor. Such a culture would promote a life that flows from inside out, an unassuming style that has a heart and substance; this culture would resist vainglory, flattery, idle talk and all pretentions; this culture would embrace suffering happily for the sake of love and readily forgive. This culture would contribute warmth, meaning and depth to our relationships. The Palm Sunday invites us Christians to be radically different in a world that lives for the most part on the outside. I wish you all a grace-filled Holy Week.